A slimmed down Sony Xperia S, the Sony Xperia P is designed to be lighter in the pocket (and the wallet) while offering WhiteMagic technology, raising the brightness level for better visibility in daylight and dimming the brightness in the dark, adding extra black and white pixels to conserve battery use. It's a trick not used on iPhone 4 or Samsung Galaxy S3 but does it actually work? Sony Ericsson made some seriously impressive Android phones culminating with the Xperia Arc S but the Sony Xperia P is a giant step forward. 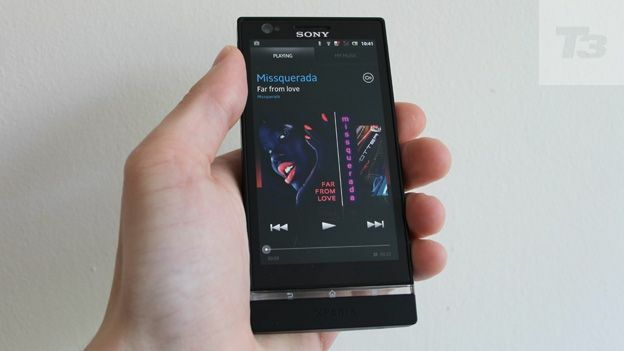 It has even made advances over the Sony Xperia S. Smooth, edge to edge glass gives way to sharp, stylish edges that are instantly Sony and mimic the range of new Sony TVs and audio products in 2012. There's no battery cover and the MicroSIM simply slots in the left hand side, while the camera button, volume rocker and power button are all on the right hand side. The left hand side houses open sockets for the supplied Micro HDMI and MicroUSB cables. The flappy Sony Xperia S cover for the MicroUSB input has been ditched and is all the better for it. The Sony Xperia P feels premium. The back of the Sony Xperia P continues the minimalist design with a neat, centred camera and flash. The clear plastic strip that features Android button icons is similar to the Sony Xperia S but is now touch sensitive, rather than just a style concession. All features are cut down versions of the Sony Xperia S but they still impress, even outside of the hardware. The brilliant 8 megapixel camera is quick and has excellent shooting modes including sweep panorama - in 3D, if you have a compatible TV. The 16GB memory can't be expanded which is a shame, especially as the inviting screen and dual core A9 processor make the Xperia P ideal for all apps and games. The Sony Timescape user interface is slick and provides some great active backgrounds but you'll want to use Google versions of most of the pre installed apps for office and ebook functions. The stand out screen is a key part of the appeal of the Sony Xperia P alongside the camera. In addition, this is an Android smartphone which is as responsive as iPhone 4S and comes stuffed with a huge amount of home screen apps to get stuck in to. Syncing with a PC is simple - a driver housed on the Sony Xperia P is installed on your PC in just 15 seconds when you connect and tweaking settings and copying music is very easy. The Sony headphones in the box are a big step up from Apple iPhone buds and the dedicated music player is impressive. The only audio downside is the the new Sony Xperia range is fussy about headphones - many inline headphones designed for iPhone and older Android smartphones won't work with the Sony Xperia P. NFC is a nice to have, and there's a range of Xperia accessories (watch, NFC tags, Bluetooth headset) which are innovative if not essential for most smartphone users. The 4-inch screen showed no signs of the yellow streak which affected some early models of the Sony Xperia S and the Bravia Engine tech really does have an impact on image quality. The 960 x 540 pixel resolution manages 275 pixels per inch against the 217 pixels per inch of the Samsung Galaxy S2 but games and movies show deeper blacks and vastly superior motion tracking. The WhiteMagic tech does work but you won't notice sudden changes except in bright light - the screen remains excellent and clearly visible at all times. There's minor battery life benefits too and when app makers use black and white colours on screen (like the LG Prada 3.0) power consumption is drastically reduced thanks to WhiteMagic. In short, it's a great screen for all situations. The dual-core A9 processor is fast, offering faster snaps than the majority of Android smartphones, even ones in a higher price bracket. Flipping between apps is equally swift and throwing even the most demanding of games at the Sony Xperia P didn't cause any problems. The camera showed minor signs of flickering when focusing on the most complex of subjects but the LED flash is bright and shooting modes are top of the class. Performing a panorama shot has a genuine wow factor and 1080p video has a similar impact with fed to your TV. We used the Netflix app to stream an HD movie via the Micro HDMI cable with excellent results on a 40 inch TV. The picture was cropped slightly and the battery life plummeted but when connected to a power source, it's a good option to have, especially since there's a decent dedicated Sony Video app too. Using the AnTuTu benchmark app, the Sony Xperia P managed a blistering 5312 score, ahead of similar sized rivals like the HTC One V which scored 2458. The daddy of the range, the Sony Xperia S, manages a 6502 AnTuTu score. The 1305 mAh battery manages just over a day of intensive use and the WhiteMagic technology does offer enhancements, alongside the extensive brightness settings. Control the use of Wi-Fi, 3G and NFC functions and you'll manage almost two days of light use after a full charge. In many ways, the Sony Xperia P is the sweet spot for an Android phone prouced by Sony. Sitting below the Sony Xperia S but becoming smaller and more practical in the process, it's the natural iPhone alternative for Sony fans or anyone wanting an Android smartphone which manages much more than rivals in terms of style and exclusive tech. Small, smart and very capable, it's only the Sony Xperia S that spoils the achievements of the Sony Xperia P.